I’m always looking for great non-traditional wedding cakes – something out of the ordinary and unique. I think today’s cake fits that description. Now, when I think about bundt cakes I think about birthday cakes with chocolate glaze drizzled on the cake. 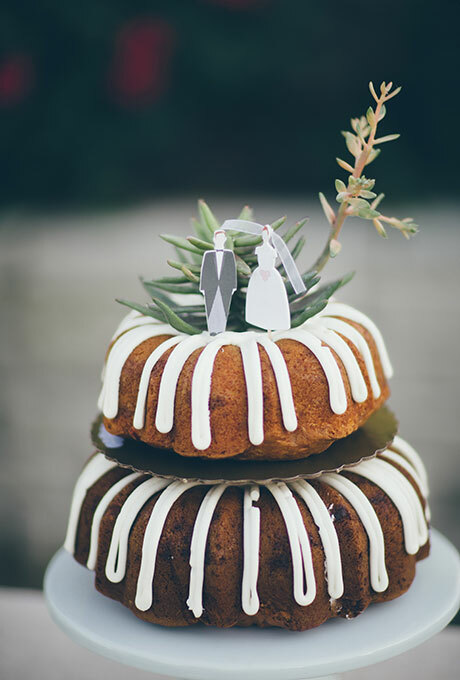 I have never thought about a bundt wedding cake. Until now. I love the simplicity of this cake – there’s no muss, no fuss. It just a two-tier bundt cake frosted with simple white icing drizzled down the sides. This cake would be ideal for an informal reception, a small outdoor wedding, or even a shabby chic themed reception. If you want to keep it simple yet beautiful this is the cake for you. And since bundt cakes have no middle to speak of I love the use of succulents to fill that hole at the top. I imagine it would also be lovely filled with bright fall flowers, like sunflowers. We found this great bundt cake here. It was created by Nothing Bundt Cakes.